The co-respondent is such a beautiful shoe. Made with a mix of leather and white buckskin or canvas, it is a summer shoe that leaps out from an outfit. It makes a definite, rakish statement – and even has a rakish story behind its name. The shoe was so-called because it was the kind of thing that a co-respondent to a divorce petition would have worn, in the days when it would have been accompanied by a stained Mac and a battered brown hat. Unfortunately, I believe it is destined to remain a bauble, an eccentricity, a foible. This is because it is trapped between the formal and the informal. Back in the days when every discerning gentleman had a pair of co-respondent shoes in his wardrobe, they were a casual piece of footwear. 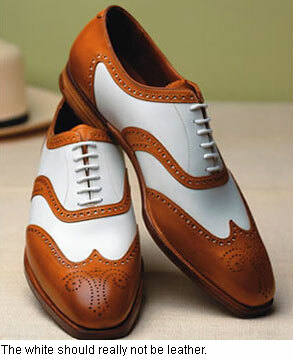 They would be worn with cream trousers and an open-necked shirt. Even with flannels on the sports field. Today, trainers are worn on the sports field and the dominant casual trouser is the jean. And in my opinion, they look wrong with jeans. The clean, white buckskin and contrast of the colours is too smart for jeans. As a quirk, they are fine – just like trainers in luminous colours, you give up any hope of harmonisation in favour of making a statement. But suede shoes work far better with jeans; the roughness of the materials brings them together. Plus, if you opt for smarter (and so darker) jeans, they will be an even worse partner for the co-respondent. It was designed as a choice for pale-coloured trousers, after all. An older gentleman can wear the co-respondent with his grey flannels and ascot, and look splendid. But then he probably doesn’t own any jeans. For the younger man, the co-respondent has no obvious or harmonious place in his wardrobe – it is too smart for casual wear, yet cannot be worn with a dark or lightweight suit. It wil only end up being worn with chinos and blazer, and even then could look like a costume. This is the sad story of the trapped co-respondent. You can follow the discussion on The sad, trapped co-respondent shoe by entering your email address in the box below. You will then receive an email every time a new comment is added. These will also contain a link to a page where you can stop the alerts, and remove all of your related data from the site. 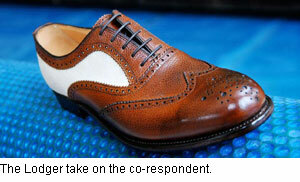 The co-respondent is one of my favorite kinds of shoe. The problem, as you say, is that it’s so difficult to find the right occasion for it. The co-respondent is definitely a shoe for the more eccentric, I for one have seen quite a few shots on the Sartorialist of this splendid shoe been successfully worn during summer. But as you so rightly said – for the young of today it is effectively out of place. I agree; I would recommend Oxblood Bass Weejuns for the younger man looking to cut a dash with his Summer footwear. I’ve worn them and, yes, they are difficult to carry off. I tend to wear mine with cream trousers and a white shirt, with or without a sportscoat. I just saw a rebroadcast of “Sunset Boulevard” in which William Holden wore his black and white spectators with light grey trousers, a navy blazer, and an open-necked white shirt. He looked great. But it was Hollywood in the 1950’s. The shoes in the top photo are exquisite! Could you please tell us the model and manufacturer? Thanks! I don’t see any co-respondents on their website these days, but perhaps someday again…. I’ve just bought a pair of tan correspondents and am struggling to find what to wear with them. Dark colours are out obviously. Light linen trousers and dark jackets/blazers. Feedback is welcome! One of my summer staples is a khaki suit. My leather & linen spectators are an ideal shoe for that suit. Also wear them with light colored khaki slacks, with or without a tropical weight navy blazer or light colored sport jacket. Always wear them with a button front shirt, no polos or T’s. Have had them for two summers now and have received several complements on the shoes. Well hey I’m a 17 year old girl and I wear black and white co-respondent shoes that I found at goodwill every day. I find them quite dapper. I even get compliments on them. I love co-respondent shoes, always have. I am unable to locate a pair to buy though, any advice? Allen Edmonds has several versions. The pair on top are Brilliant beyond the Definition…Spectators are truly Artistic & Epic…thank you for such a great article,Simon……. I do agree that the spectator shoe, however timeless or eccentric, is a trapped shoe in terms of style. However, In some circumstances makes a very classy and stylish addition to a light colored suit, when given a black/white or gray/white combination, such as a black and white spectator with a light gray suit. Hi, I’d like to know your opinion about white buckskin shoes with red rubber soles? Are they also outdated/too sporty/don’t go well with modern outfits? Closest thing to a civilian uniform for men is the navy blazer with brass buttons. Worn with grey flannels in winter, khakis in spring & fall. I wear mine with whites in the summer and always with white bucks. USMC and Navy summer dress uniforms are worn with white pants and black shoes but for civilian wear I think the bucks are a far better choice. If you’re concerned about the red soles, try them with the recently popular faded red slacks (variously called Breton Reds, Nantucket Reds, etc.) and a matching white fabric or leather belt. I have seen b&w spectators worn by the groom of a wedding. They added a wee bit of statement & pop against his b&w formal wear.